Perhaps its a subject you think you understand, perhaps it's a subject you just don't want to read about, perhaps it's all a bit too painful to read? That's fine, nothing's compulsory here and I realise this book may be just more than many people can cope with. In fact I have a feeling that In Search of Adam is going to be one of those books that readers will either heart or hate and there may be no middle ground. I'm going to declare forthwith that I'm in the heart department and that's very unusual because it's a book about my pet- hate- subject- to- read- about- for- pleasure, child abuse. After all these years of working in child protection I'm more of an expert on it than I'd ever choose to be. Next time round I'm going to be a librarian. 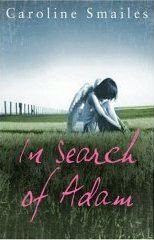 "jude, I have gone in search of Adam, I love you baby"
You can hazard a guess at this point that Jude's problems are only just beginning and what unfolds makes truly harrowing reading because it could be argued that Caroline Smailes has done for child abuse what Mark Haddon did for autism.Through the limits of Jude's childlike understanding things happen over which she has no control and no understanding and it's all very very real.If you didn't understand the impact of all this on an innocent child beforehand you most certainly will by the time you have finished In Search of Adam. Don't be put off by ideas of a misery memoir, this is subtly different and there is a powerful redemption of sorts that for some reason should but doesn't leave you in the depths of despair.Just sad. If nothing else the book clearly shows how childhood abuse can lead insidiously to patterns of obsessive compulsive behaviour, self-harming, isolation, low self-esteem, bulimia and worse. For Jude these are rooted in the events of her childhood and that is when the problems start; you clearly understand exactly why she does what she does even at such a young age. "The summer came and went. The summer when I left primary school. I left the watching eyes. Miss Waters was getting nearer to the truth. I was leaving her little clues, She was clever. She was picking up the clues.But. I left.I left before she figured it all out"
"They were right. I wasn't normal. A reet strange bairn. I'm not normal. But they never asked the questions. They never allowed the words to escape from me. They never realised that I was trying to communicate. Sicking up the words that I couldn't voice. Trying in the only way that I could find. Trying to tell them all the things that were eating away inside of me"
The writing style is unusual and often cleverly limited by an authentic age-appropriateness for Jude's thoughts and language, but I quickly got used to that and it worked well as an additional means to emphasise what was happening to her. Dust jackets important as always to me and the design of this one would seem to be the result of a collaboration between The Friday Project and Snowbooks.You can look at a dust jacket and think "oh yes very nice" and barely notice it for the rest of the read or you can have a dust jacket like this one that somehow carries you through the entire book. As I was pondering what I'd read this dust jacket became a really important focal point as did the endpapers, but I'll let you discover those for yourselves. A word about the words, often strangely laid out on the page. This could easily be dismissed as a gimmick but I understood it as something else. If obsession is about repetition and patterns of behaviour and often a means of gaining control in uncontrollable situations then the order that Jude aches to find in her life is being cleverly reflected visually in the unusual use and placing of words on the page. I feel I have barely scratched the surface of this book's significance but I have emerged feeling suitably reminded that there is always more to learn on a subject I thought I understood quite well. Books like this must be agonizing to write and equally difficult to promote and sell but for starters I'd love to prescribe it as compulsory reading for all those professionals like me who find themselves on expensive multi-agency child protection courses, teachers, social workers, police, health visitors, child and mental health workers etc. There's always a session on the effects of abuse on the child, bit of a powerpoint intro, off into groups, groan, talk about the lunch, flip charts, felt pens, last five minute rush to have something intelligent to feedback to the group.Plenary.No one ever wants to do the feeding back.Usual story. We could all have the day off instead to quietly read this book, save a fortune and learn far more, and for that reason, amongst many others, it gets 5* from me.